»Food»Enjoy Delicious Aged Cheeses – Even If You’re Lactose-Intolerant! Enjoy Delicious Aged Cheeses – Even If You’re Lactose-Intolerant! For the past month, I have been on a gluten-free, lactose-free diet. I knew it would be a tough transition: I’m a vegetarian! I live on carbs! But one of the biggest difficulties I found was that I thought I would have to give up cheeses. I love cheese. Delicious cheeses from around the world make up a significant portion of my diet. So imagine my delight when I learned that I could still keep my favorite cheeses in my diet. In a world with so many people looking out for potential food allergies, it’s great to know which products are entirely safe! I caught up with a representative from Cabot Cheese at a health and sports expo in my area — read on to see what I learned! The labels of Cabot’s cheeses could not be any clearer: huge graphics on their products spotlight products that are lactose-free, halal, gluten-free, and supportive of local New England/New York farms. But how could cheeses be lactose-free? Every cheese out there isn’t lactose-free, but Cabot offers so many great tasting varieties of cheddar that are, you surely won’t get bored! I got a chance to sample the Jalapeno Cheddar, and it’s one of my new favorites. The classic cheddar taste gets just enough kick from the peppers without being too spicy. These products don’t sacrifice anything when it comes to taste and quality, so you won’t feel like you’re having “diet” cheese or any of that fake plastic-y kind you sometimes see in the allergy-safe aisle. Drink milk with meals or snacks. Milk is more easily tolerated when it is mixed with other foods. Eat yogurt with active cultures. The “friendly bacteria” in yogurt helps your body digest the lactose. Eat aged cheeses — they contain little or no lactose — like Colby, Jack, Swiss, Parmesan, and Cheddar. As always, read your labels carefully and ask your doctor before you make any big changes in your diet. 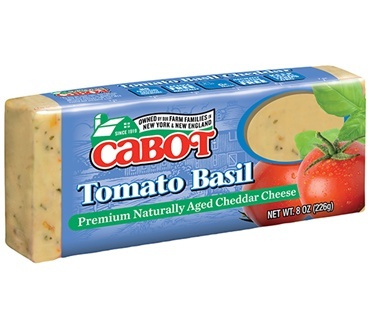 For more information on dietary restrictions and for great cheesy recipes, check out cabotcheese.coop.